MARIUPOL, Ukraine -- Explosions have been heard for a second night near the port city of Mariupol in eastern Ukraine. Sky's Katie Stallard said the explosions sound like heavy artillery fire, adding the exchanges will further threaten the region's tentative ceasefire. "We can hear a series of explosions, again in the same direction towards the east of the city," Stallard said. "We know that the rebels really are very close now, and the two sides are about 15 kms (9 mi) apart. "It is difficult to tell whether it's incoming or outgoing, but it is both the kind of deep explosions of artillery and salvos of what sound like rocket fire." The fresh fighting comes after an attack overnight on government forces near the city, and shelling near Donetsk, which put the ceasefire in east Ukraine at risk. Plumes of smoke could be seen rising above Donetsk airport on Sunday, which had been occupied by government forces. 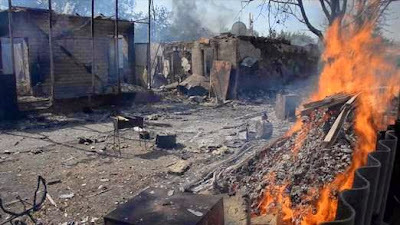 One woman died and four others were injured during renewed shelling in the port of Mariupol, city officials said. Local media said a 33-year-old woman was the first civilian killed since the ceasefire began on Friday evening. The ceasefire in Ukraine had largely been holding since it came into force on Friday at 4pm UK time, although there had been sporadic reports of skirmishes from both sides. Many on the ground had expressed scepticism about its durability, and both sides blamed each other for renewing the fighting. Ukrainian President Petro Poroshenko said he had spoken to his Russian counterpart Vladimir Putin by phone on Saturday to discuss ways to make the ceasefire agreement more durable. The West and Kiev accuse Moscow of supporting the rebels by sending tanks and troops over the border, although the Kremlin has consistently denied the allegations. Russia issued a separate statement on Saturday warning European leaders of an unspecified "reaction" if the European Union followed through with its decision to impose further sanctions. The sanctions were agreed at the two-day NATO summit of world leaders in Wales. Prime Minister David Cameron indicated they could be suspended if Russia withdraws its troops from Ukraine and the ceasefire is observed.